Something Her Universe had mentioned to us last year was the possibility of a geek fashion show happening at San Diego Comic Con in 2014, and we’re thrilled to see that it’s totally happening! Not only that, but it’s up to geeks like all of us to come up with some great designs for the show. 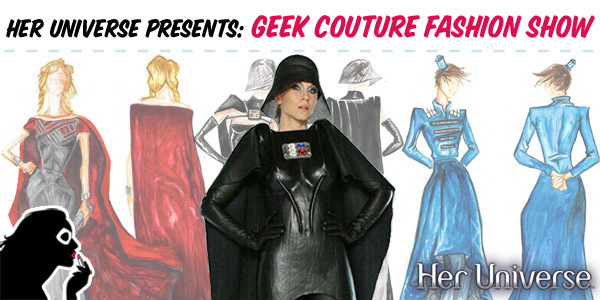 Starting today, you have until the 4th of April to submit designs that you consider “geek couture”. You can submit up to 3 designs, but only one will be chosen. Once all the designs have been submitted, a panel of judges will pick their top 30, and those designers will have the opportunity to make and showcase their designs at San Diego Comic Con! There will be two winning designs chosen, one by the panel of judges, and the other by the show audience. And the prize? The opportunity to co-design, with Ashley Eckstein, an exclusive Her Universe fashion collection for Hot Topic! At a time when places like Pinterest and DeviantArt are flooded with design concepts of how geeks would like to see their favorite superhero or Disney princess re-imagined in runway or ready-to-wear form, not to mention actually seeing Star Wars on the runway during Fashion Week, the timing of this event could not be more perfect. And who better to be leading the charge and championing geek fashion than Her Universe?